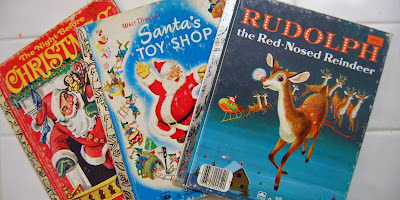 This week's Great Monday Give is a nice three-way Little Golden Book prize package that includes vintage, scribbled-on, well-loved but still great reading copies of Rudolph the Red-Nosed Reindeer, Santa's Toy Shop and The Night Before Christmas. To be entered to win these too-cute-for-words titles, simply comment on this post before Sunday, December 14 at midnight. The winner of last week's give of A House is a House for Me using the trustly blind scroll and point method is Swati! The minute you can muster the strength (lest the thrill of the win has zapped your energy entirely) please e-mail me at webe(at)soon(dot)com with your mailing address so I can send out your prize right away. I just started reading your blog, and I love it. You've reminded me of books from my childhood, as well as introduce me to others. I would love to win those. I remember all of those from when I was a child and would love my children to read them as well. Thanks for the opportunity! These books conjure wonderful Christmas memories, and I would love to share them with my daughter. Thank you for making these books available! These books are great. I am teaching my almost 3 year old son what vintage books are and why they are so cool! I totally had that version of Rudolf when I was a kid! It was fantastic. Thanks for so many trips down memory lane! Gotta love Little Golden Books! Thanks for the chance to win! We're lacking in Christmas books at our house! Oh, how I loved my old copy of Rudolph. Oh, how I wish I had it back. I guess I'll keep wishing . . .
Oooh we love Little Golden books around here and we are in the Christmas groove collecting lots of old Christmas books. We sure would love to add these to our collection. I just found your blog and I am in heaven. My daughter is 6 months old and I am working on building up her book collection with as many oldies (but goodies) that I can get my hands on. These are wonderful! Thank you for sharing them! Wow: great choices! I'm so excited for the chance to win ~ thank you. I used to love Santa's Workshop when I was a child and would love to share it with my daughter! 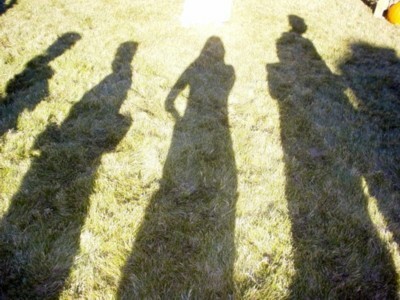 I've been reading your blog for a while now and LOVE it. It's fun to see all the books I loved reading as a child and find out about new ones I've never seen. Thanks! I love your blog. I just started reading it in the last month. I always dream that my mom still has these Golden Books buried in her basement somewhere... but deep down I am not so sure. What great classics!! My kiddos and I just finished watching A Charlie Brown's Christmas. To see your Monday post REALLY sent me into a flashback! How great it would be to have these books for all of us to read! keep up the great work! I love seeing what you find! Christmas books! You can NEVER have too many, these are wonderful selections too! Thanks! I would love these books! I love anything vintage and anything that can be read. My little one would love to enjoy those before bedtime. Count me in! I've been following your blog for a little while, and I love it. You've reminded me of several much loved books from my childhood. I've started a golden book collection for my son and these would be perfect. I love vintage children's books, too! I'd love to win these Christmas books. This is the copy of Rudolph we had growing up! What a fab giveaway! Children of today seem to be "rediscovering" Enid Blyton, which rather surprised me because I always found it took a good two-thirds of the book for any real action to occur. Look for copies from the sixties or earlier. Anything later isn't genuine Blyton. Blyton wasn't actually a very good writer but she had one great virtue: she never preached to children as so many writers of today do (it's getting worse than in Victorian days when every story had to have a "moral") but set out merely to entertain, which is what all fiction for children should be about. Wow, those bring back memories-how fun to pass them on to the next generation! Your blog is great. Would love to add these to our growing collection of Christmas books. Thanks! Golden Books are a timeless classic loved by a certain little boy I know :) What could be better than 3 wonderful, well loved Chritmas themed ones? If I am selected to win these books, I know they will put a smile on his face as well as that of whomever reads them to him.